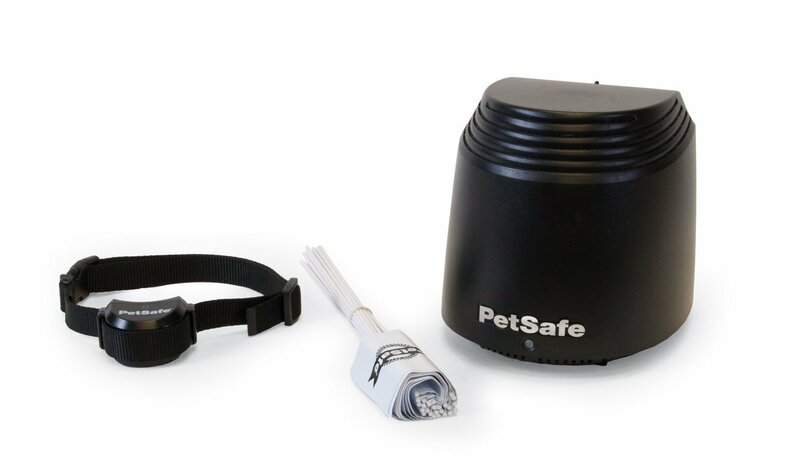 The PetSafe PIF00-12917 Stay and Play Wireless Fence is a great choice for individuals who love traveling with their dogs. This model is easy to set up and take down within a couple of minutes. With this wireless fence, you just need to plug in the transmitter, set the size of the circle you want your dog to remain. The PetSafe PIF00-12917 Wireless Fence offers your dog freedom of movement without burying numerous wires in order to set a boundary. This fence comes with a small transmitter that you can installed in your home. The transmitter emits a wireless signal that creates a circular boundary for your dog to be contained. The area covered is from 22 to 105 feet in all directions (up to 210 feet across). Combination of transmitters can help you to cover a larger area. Regardless, we have top 5 products review on Best wireless dog fence in another article. What's Included with PetSafe PIF00-12917 Fence! The wireless fence also features a rechargeable and waterproof collar, which comes in a compact size. The collar is also well contoured to allow for a comfortable fit around any dog size. The collar also has five correctional levels and a tone mode that helps you in training your dog. Here are additional features of the PetSafe PIF00-12917 Stay and Play Wireless Fence that you need to know about before purchasing it. Unlike its predecessor, the PIF -300 model, the PIF00-12917 model collar has a rechargeable battery. This will save you the hassles of replacing the batteries every now and then. To charge the collar fully you just need to wait for only 2 to 3 hours. When the collar battery energy falls below twenty percent, the receiver will notify you by blinking red signal after every five seconds. The collar also starts to blink yellow light whenever its battery energy falls below sixty percent. These alerts make sure that you keep the collar’s battery charged ever time. The red light will turn into a green one, indicating that the collar is fully charged. You do not have to worry about overcharging since the gadget has a safety feature that prevents the gadget from overcharging. A fully charged receiver can run for up to three weeks but this will depend on how often it delivers corrections. The PetSafe PIF00-12917 wireless fence model comes with five different corrections intensities. You should vary using a button to apply your desired correction intensity to your dog. When training your dog you can use the tone only correction setting. You will also be provided with boundaries flags. When your dog approaches the boundary you have set, the gadget will start beeping the warning tone. Your dog will receive a static correction if it exceeds the warning zone. When you compare this models transmitter, it is about a third the size of the previous model. This makes it easy to transport, since you do not need to carry or bury any wire. Therefore it set up takes very little time, making it an ideal gadget that you can use when camping, or when attending an outdoor activity. The collar will ensure that your dog is well behaved all the time. It will also eliminate the risk of you losing your dog since he cannot go beyond the point you have set. Although this is very rare, your dog might enter boundary zone and despite the static correction being delivered, the dog may stop moving. To prevent hurting your dog by delivering static correction for long period, the gadget has a built-in safety feature that switch it off when the correction is delivered continuously for fifteen seconds. You do not have to have several wireless fences if you have more than one dog. This containment system has the ability to have unlimited collars added to the system allowing for a greater freedom. You can adjust each collar size and the correction level making it suitable for all dogs. When you add up the total weight of the collar and everything attached to it, it weighs about 3.1 ounces. This makes it one of the most compact and portable model in the market. You can adjust the collar to fit dogs weighing as low as 5lbs and neck sizes varying from 6 to 23 inches. The collar also features two short contact points that are replaceable with the other longer pair that come with the package. You should remember to check the point up to twice for a week. This will help you to adjust the collar to fit your dog perfectly. During the first year of your purchase, the company gives you full warranty on any malfunctions regardless of parts affected. After the first year, the company also offers a limited life warranty that entitles you to receive significant discounts on repair that may be needed, depending on the type of damage that develops. It is very important to read the manufacturer’s safety instructions in the manual such as keeping the transmitter from dust and excess moisture. Although not always, this may void your warranty. PetSafe PIF00-12917 Stay and Play Wireless Fence is suitable for almost all dogs breeds, size, age and personalities. This makes it a quality product that offers great peace of mind for individuals who do want a physical fence but would like their pets to remain safely in the yard. This model is also ideal for pet owners who have larger yards or for those who would like to extend the reach of their PIF -300. The gadget will also enhance safety while traveling with your dog and allow you to let them to roam within the boundaries for them to explore.